Writing high-quality articles takes a ton of time, but sadly many high quality articles won’t even get read. According to Copyblogger, 8 out of 10 people will read headlines but only 2 out of 10 will actually click on it and read the rest. To maximize your effectiveness with blogging or content marketing, you really have to write amazing headlines that people feel compelled to click. Learning copywriting is one of the best ways to get good at headline writing. Copywriters train themselves to write content so good that it convinces people to actually spend money and purchase products. Want to become a headline writing ninja? In this article, I’ll also show you examples of different copywriting techniques that you can use to write headlines to make them more enticing. I usually try to write at least 5 headlines for every article and then pick the best one. A lot of professional bloggers and editors recommend doing this and it has definitely helped me write better headlines. There’s no formula for writing the perfect headline every time, so we need to write multiple headlines to brainstorm ideas. 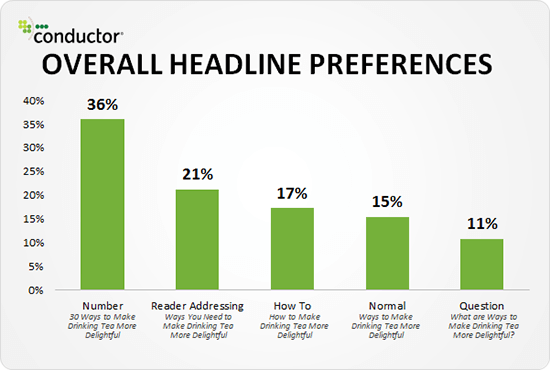 Headlines work best when they are very specific and one simple way to be specific is to add numbers to your headline. In fact, a study by Conductor found that people prefer headlines that contain numbers over other types of headlines by a significant margin. For example, which of the following headlines is more compelling? Most people would find the second headline more appealing because the first headline seems very generic while the second one contains specific numbers which implies that the writer is credible on the subject. Another tip for using numbers is to try and use odd numbers instead of even numbers. A study conducted by Outbrain and Hubspot found that headlines with odd numbers get 20% more clicks than headlines with even numbers. But what if your article contains an even number of items? Here are a few simple solutions…. Make the last item a bonus item. For example, if you have a list of 7 Writing Tips, you can just present the 8th tip as a “bonus tip” instead of assigning it a number. Just use an odd number in the title anyways. For example, if I have a list of 22 tips, I might instead write it as “21+ Marketing Tips for Your Business”. Writing the title this way also gives me the option of expanding the post later to include more items. One way to create more engaging titles is to use parentheses in your headline. Some of the world’s most respected copywriters use parentheses in their headlines as well as within their copy. Additionally, Outbrain and Hubspot conducted a study of over 3.3 million paid links and found that headlines with brackets performed 38% better than headlines without them. Writers can use brackets or parentheses to separate clauses in a headline and in the examples below, notice how parentheses also create a little visual variety. You can use parentheses to make headlines more appealing in several ways. One way to use parentheses is to mention an added bonus or give readers another reason to click. Another use of parentheses is to add a short phrase that will generate curiosity. Sites like Buzzfeed and Upworthy used this tactic a lot when they were starting out. One great way to use parentheses is to add a credibility booster to your headline. Give readers a reason to view you as an authority right away and they’ll be much more likely to click through and read your article. You can think of parentheses as embedding a really short sub-headline into your article title. Adding just a few words in parentheses can strengthen your headline by adding credibility statements, promising added benefits or giving readers another reason to click. The Outbrain study also found that using hyphens and colons can increase click through rates by 9% on average. Similar to parentheses and brackets, hyphens and colons also add visual variety and encourage you to write more interesting headlines. A simple formula for using hyphens and colons is to use your SEO keywords phrase at the beginning and then add a compelling title after it. Of course you don’t have to use this formula. Feel free to get creative if you can think of a good headline. Another thing you can do to improve your headline writing skills is to split test headlines when emailing your list about a new blog post. Most email programs like Mailchimp will allow you to test different headlines when you send out emails by sending each variation to a subset of your email list and then emailing the rest of your list with the winning headline. You may be surprised to find which headlines work best. Sometimes shorter and simpler headlines can outperform longer and more detailed headlines. In any case, split testing headlines helps you better understand your audience and allows you to write better headlines in the future. If you use WordPress, there are plugins that enable you to test headlines right on your blog. Check out WP Superstars’s post on split testing plugins for WordPress to learn more. Another tactic that can bet people to click on your headline is to ask a question. Questions can create curiosity and people who want to know the answer to the question will click your headline and read the article. Make sure it’s not a question that they can easily answer, but one that will provoke thought and generate curiosity. Example: Are You Making Any of These 7 Common Blogging Mistakes? If you are a blogger, you may be curious to at least see what the 7 blogging mistakes are. Questions are a great way to construct headlines that get clicked. Many bloggers know that they should do keyword research to find keywords that people are actually searching for, but many bloggers skip this step. However, keywords are important if you want to get long term SEO traffic to your blog articles. 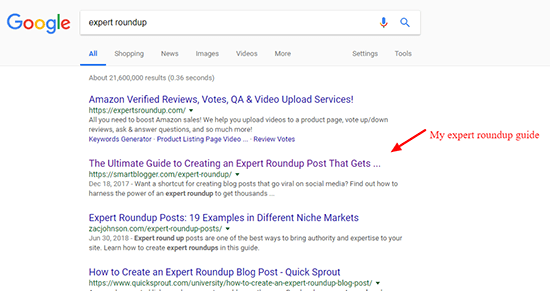 One blog post that I wrote that got continuous exposure was my expert roundup guide on Smart Blogger that is currently ranking for the phrase “expert roundup”. It’s been ranking for that phrase for several years, so even though I wrote it years ago, I still get exposure from that guide. Additionally, that article continued to get natural links because new people found it through the search engines and it is perhaps the most detailed guide on the topic. Creating headlines that are SEO optimized can help people discover your content, so it’s worth taking the time to do it if you are investing time and resources into content creation. Another good exercise when writing headlines is to search Google for other articles on the topic and see what other headlines you are competing against. Looking at other people’s headlines might give you some good ideas for your own headlines. Think about how you can create a headline that is better than competing articles or how you can create something that offers something different. If you’ve done a good amount of blogging in the past, then consider reusing headlines formulas that worked well for you in the past. Looper is an entertainment site that features articles and news about movies and celebrities. I discovered them on YouTube because their videos kept popping up in my feed. If you’ve written a headline in the past that did really well, consider using the same formula for writing headlines for future articles. Outbrain conducted a study of 65,000 ad headlines and they found that headlines containing negative words like “never” or “stop” performed 30% better than headlines without them. They also discovered that headlines with positive superlatives like “best” performed 29% worse than headlines without them. The reason that headlines with positive words performed worse is likely because such headlines are overused. So once you’ve come up with a good headline, consider writing a version from a negative perspective. For example, instead of “5 Amazing Ways to Lose Weight”, you might use a headline like “5 Things You Must Avoid to Prevent Weight Gain”. Your blog article title doesn’t have to be the same as your SEO title or the headline that you share on social media. If you are writing articles on a high traffic blog, then you may want to consider writing different headlines to target different channels. Slate.com uses this approach to create headlines targeted towards different channels. Article Title: Why Do We Keep Planting Stinky Gingkos? SEO Title: Why we still plant smelly ginkgo trees. Social Media Title: Ginkgo Trees Smell Like Vomit. Why Do We Plant Them All Over Our Cities? The social media title is more edgy and likely results in more discussion and shares on social media. The article title is short and straight forward, but doesn’t contain keywords like the SEO title. Another tip for improving your headline writing skills is to practice writing different sub-headers within your article. Some bloggers will spend some time on the article headline, but don’t put much thought into the sub-headings throughout the article. Try to rewrite sub-headers so that each one is a compelling headline that makes readers want to read each section. You can also try creating a unique sub-header for the concluding section. Most people simply use “Conclusion” or “To Sum It Up”, but with a little thought, you can come up with a better sub-head for your final section. Asides from making your article more engaging, rewriting sub-headers is a great way to practice your headline writing skills. These tips will give you some ideas on how to write compelling headlines that people will click. 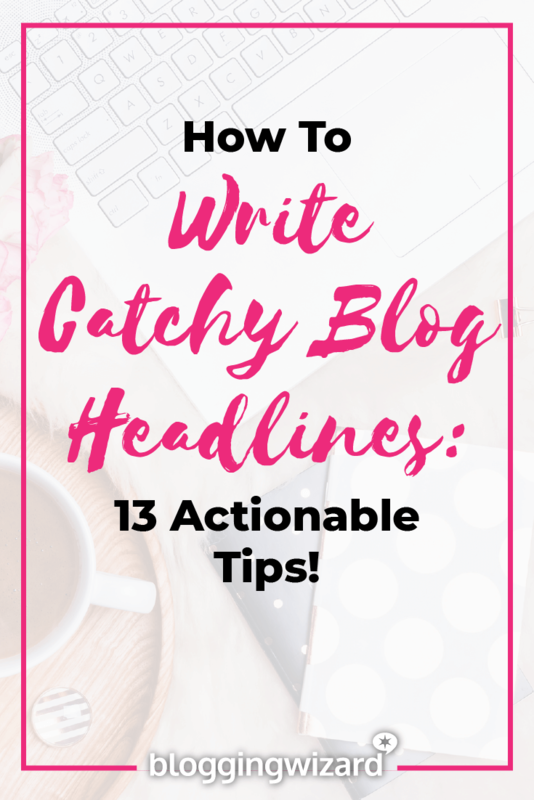 Writing great headlines is one of the skills that allowed me to get my guest posts featured on popular blogs in my niche as well as create articles on my own blog that got shared over a thousand times. Remember that writing headlines isn’t a skill that you can master overnight. It’s something that you should keep practicing and continue to get better at.